Fiji’s economy is not only witnessing a record-breaking year but a record-breaking era of growth and development. This was reiterated by Prime Minister, Voreqe Bainimarama during the 2018 Prime Minister’s International Business Awards in Nadi last night. Bainimarama says this growth is good for the entire nation and not only for business. He told business leaders they play a vital role in taking the economy forward. Hence, the PM is calling upon businesses to don’t take a back seat when it comes to the management of the economy. Bainimarama says it is their duty to bring experience and expertise to the table by giving professional opinion when it comes to matters affecting economic growth. 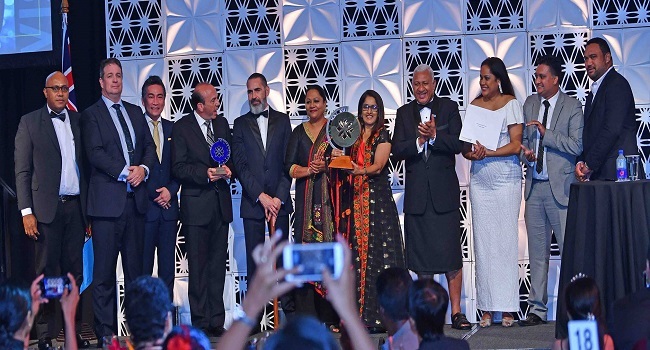 Meanwhile, Fiji Airways scooped two awards including the prestigious Prime Minister’s Award and the e-Commerce business of the year. Ram Sami and Sons, Fiji Airports and Rosie Tours were among other winners.